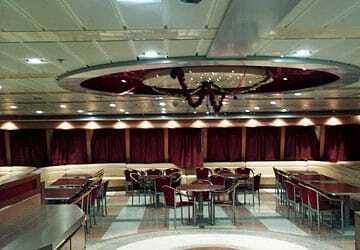 The Catania ferry carries up to 840 passengers and 160 cars and offers an array of onboard facilities to keep you entertained during the crossing including a self-service restaurant, a choice of bars, a casino, a shop, a children’s play area and a choice of cabins. Onboard you'll find comfortable air conditioned en-suite cabins with a choice of both inside and sea view (outside). 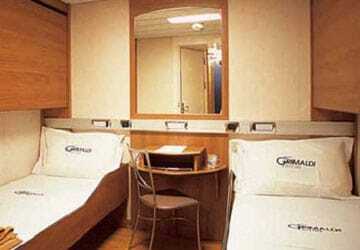 The Catania also has 2 luxury suites with double beds as well as 2 cabins designed for disabled passengers. Each cabin contains 2 standard beds, 2 foldaway beds, a writing desk, a 4 door wardrobe, a mirror and a small armchair. In addition, the 2 Luxury suites feature a bedroom with a double bed, a TV set and a living room with a divan with double bedding. For those who prefer not to book a cabin there are 62 reclining seats available. 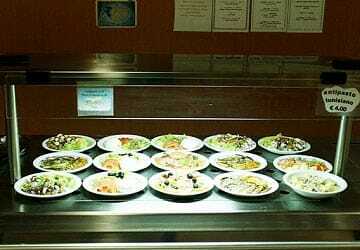 Meals are available in a spacious and elegant self-service restaurant with a choice of many different dishes on offer. The Vesuvio Club bar features a comfortable cafe room while in the outdoor sun deck bar (open in summer) you can have a drink and relax on one of the deckchairs in the sun. 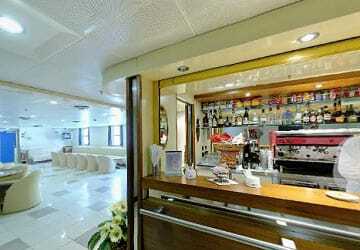 You’ll find the onboard shop selling numerous products and souvenirs on the Catania. 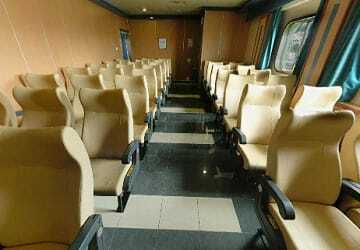 Children are well catered for with Grimaldi Lines and the Catania features a dedicated child’s play area to keep younger passengers occupied during the trip. 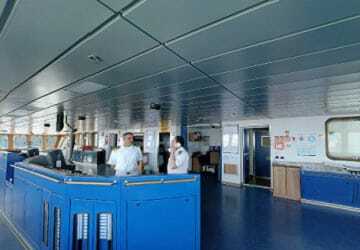 Assisted can be provided if required however you will need to inform the staff on arrival at the port. 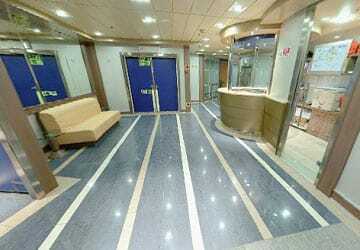 The Catania contains 2 cabins designed for disabled passengers. Please Note: Whilst we have taken great care in making our Catania guide as accurate as possible, onboard facilities, services and entertainment may vary depending on the date and time of year that you travel, facilities mentioned may change without notification and ferry companies reserve the right to operate vessels other than those mentioned at time of booking without prior notification. We took the ship from Palermo to Salerno and had a great experience. However, the bed may not be long enough for those who are more than 190cm. Punctuality and organization during boarding and landing procedures in Brindisi and Igoumenitsa. Good service on board, cleaning and staff. Excellent. Comfortable and quiet trip. With no issue. Arrived in Greece with 30 minutes delay. Very good and comfortable journey. "boring trip but on time"
Very pleasant. Good food. Everything went smoothly! İn spite of checking in late the port staff were extremely helpful and we were loaded in plenty of time for a prompt departure. The purser and his staff were a delight to deal with. The cabin was excellent - clean and comfortable. The only let down was the dining department with the food a disappointment and the staff giving the impression they were doing a duty shift more than they wanted to. 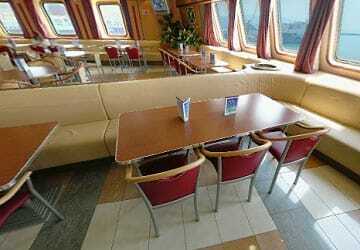 I had a relaxing overnight journey from Patras to Brindisi - the facilities are slightly dated, but fully functioning. Disembarking is a nightmare and should be better organised but other than that I would highly recommend this ferry service! 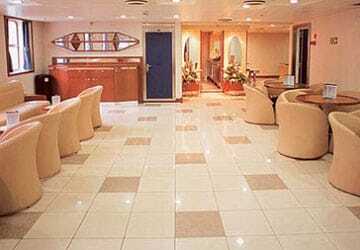 "Grimaldi Lines can't touch Moby Lines"
We have travelled several times on board various ships. 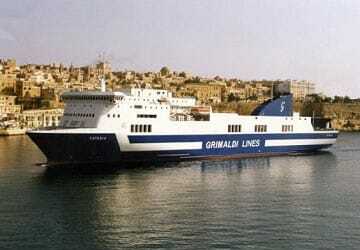 This year, we travelled with Grimaldi Lines from Brindisi to Igoumenitsa. This crossing is only recommended for freight. We had to book a cabin because there was no other accommodation left. The cabin was ok. On deck, there were no seats or chairs available. The restaurant was overcrowded and did not have enough food. We all had to leave early because apparently it had to be cleaned, so everyone had to leave the restaurant and find somewhere else to sit. We headed for our cabin booked and discovered that we were supposed to check out at 22:30. The arrival time was 01.30, meaning we were stuck with our luggage, and in the crowded hallway. Worthless trip.